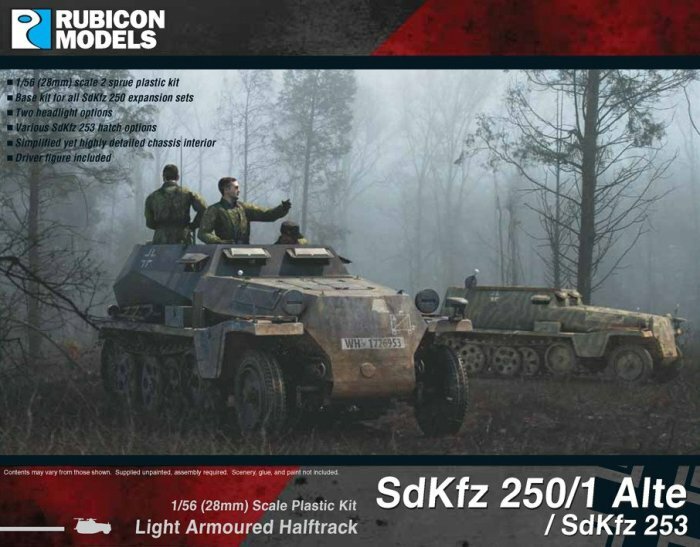 The SdKfz 250 was a light armoured halftrack, very similar in appearance to the larger Hanomag-designed SdKfz 251, and built by DEMAG, for use by Germany in World War II. Most variants were open-topped and had a single access door in the rear. The SdKfz 250 was adopted in 1939 to supplement the standard halftrack. Production delays meant that the first 250 did not appear until mid-1941. The vehicle was used in a wide variety of roles throughout World War II. The basic troop carrier version was used as an armoured personnel carrier for reconnaissance units, carrying scout sections. This basic variant usually mounted one or two MG34 machine guns. Later variants carried 20 mm, 37 mm, and even 75 mm guns to support the more lightly armed versions. The initial design (Alte, the “old version”) had an armoured body made of multi-faceted plates, which gave good protection against small arms fire, but made this design both expensive to manufacture and quite cramped. Production of this early version stopped in October 1943 with some 4,200 built, and a second version (Neu, or “new version”), greatly simplified to speed up manufacture, began replacing it. In both variants, the armour was useful only for stopping small-arms fire and small artillery fragments. Heavy machine gun fire, anti-tank gun fire, or almost any tank gun could penetrate the SdKfz 250 at long range. The SdKfz 253 variant was fully enclosed, and was used by artillery forward observers to accompany tank and mechanized infantry units.